The Los Angeles Fire Department is reporting that a woman was killed just after 1pm on Hauser by a Food-4-Less big rig truck. Food4Less is the same company as Ralphs, both part of Kroger. Hauser Blvd near Wilshire, where accident occurred. The accident occurred at 675 S Hauser Bl, just north of Wilshire, near the Ralphs market and Park La Brea. She also reports that they finally covered up the body, more than an hour after the accident. If you have additional details about the incident, please let us know with a comment below. For those in the area, traffic is still being allowed to go down Masselin but obviously Wilshire is closed between Hauser and Masselin and most traffic is being sent down 8th st. I work in the highrise building at this intersection. These details are all we know as well. Traffic is backing up, so please detour around Wilshire Blvd. From my 16th floor office window, I can hear people honking. So sad. I was there and saw it happen, I ran over to help but there was nothing to be done. So very sad. I cant get the image out of head. I am in a daze. Thank you for rushing to the aid of a stranger in need. Such a selfless act speaks volumes of your character. You may benefit from support or counseling. Please consider calling 2-1-1 to find services near you and available at no or little cost. I was right at the intersection when it happened talking to my friend. We thought it was just a fender-bender, but very soon realized there was a life-less body underneath the truck. It was terrible. The police was there within couple of minutes and they covered her face. A bit later fire truck came and covered her body, it was not uncovered for an hour. I could not go back to work after that and am still in haze. I work in the area and could see the scene from our balcony over a block away. This is really sad. As a pedestrian you must stay alert at all times, do not think that because a light is in your favor or you are in between painted white lines you are safe. When I was a child I remember my dad telling to look around that while a pedestrian on the street you are a “visitor” and that the cars really own the space. If you keep alert while in the street, it is almost impossible to get run down. I am not defending bad discourteous drivers, but if you are involved as a pedestrian with a vehicle, guess who always wins? Stay alert…stay safe. Yep, you are right, this one was so bizarre though – the truck was waiting to finish a left turn from Wilshire and she somehow got stuck under it – as he did not see her. Some people yelled at him, but it was too late, everything happened in a split second, she did not even scream out. Just awful. I was the first one stopped at the light as the truck turned on to my street (Hauser), but I didn’t see the impact, only the response of onlookers and the poor mangled woman. Really heart-breaking. I saw the cop arrive and a considerate female passerby cover the face with her jacket to at least conceal her head. There was another guy who was actually filming the victim on his iphone if you can believe it — disgusting. She was definitely dead by the time the truck left the intersection. I wish the local news would have given more information, but they didn’t even mention it. Thanks to all of you who witnessed this for finding your way here to share your thoughts and feelings. I’m very sorry that you had to experience this. My heart goes out to the woman’s family as well. If anyone has details on who she was, please do post it. All we know right now is that it was a woman, no idea on her age or anything else. One of the primary reasons I started Weho Daily was to bring awareness to the very many pedestrians who are hit on streets in our area to hopefully help bring about changes to save lives. I work in the area as well. We went out to go to Ralphs and saw the woman in the street. Apparently everything happened so fast. I feel for her family and the people who witnessed this horrible tradgedy. You are all in my thoughts and prayers. I am going to be way more careful as I cross the street from now on! I live on Hauser about half a block from Ralphs. I cross that intersection every day. Today there is a memorial of flowers and candles there, a sobering reminder of how fragile life is. I read on another blog that a bus driver witnessed the accident and said she tried to cross the intersection diagonally. Whether this is true or not, it’s a good time to remind people to obey the traffic signals. They don’t guarantee you’ll be safe, but they sure increase the odds. The accident was at the intersection of Hauser and Wilshire. I witnessed the incident from right after she was struck, until they took her body away. I called 911 and a police officer drove up as i was on the phone. When her head was covered, I knew she was already deceased. I am quite traumatized and so sad and sorry for her and her friends/family. I have been hearing rumors on who she was exactly, and how it happened but I don’t want to write something that is not true. I believe she was a local to the area. Does anyone have anymore information on who she was or if her family is near? I feel immensely for the driver as well, and I hope he/she is receiving therapy to deal with this. I pray this woman is now in a better place. 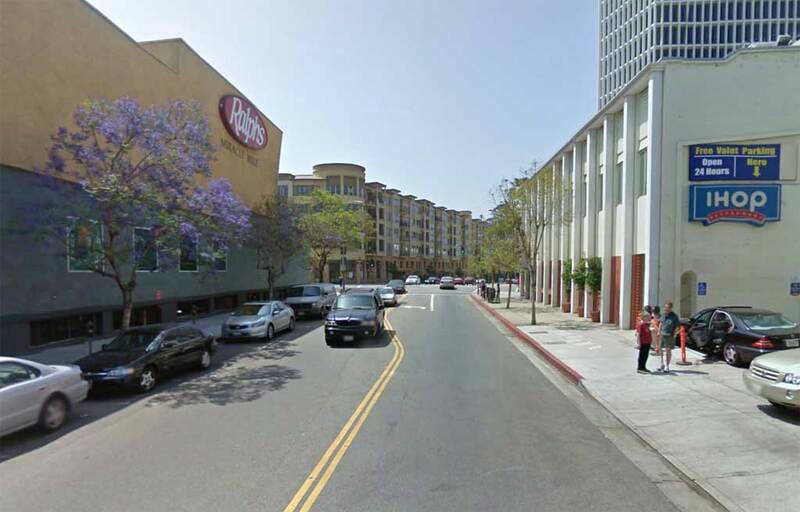 I am a driver for Ralphs Grocery, and have delivered to this store many times. I first want to extend my symphaty to the friends and family of the deceased woman. I am also friends with the driver involved in this accident. I have not had a chance to speak with him yet, but just to let eveyone know he is a good driver and a hard working responsible person. I am sure this will affect him for a long time to come. Please keep him in your prayers also. The big rig driver stopped right on Hauser and I did not look to see who came out of it. But there was a young guy in a green Tshirt walking around with horror look on his face, so I presumed it was the driver. He was having an out of body experience….it was terrifying just seeing that. I am still thinking about it every 2minutes. If you find out who the lady was, please post it. It seems so wrong to witness someones dying, yet not know who she was or know who to pray for…. I’d like to know who was at fault and what the woman’s name was. i’ve heard a few stories from people in the neighborhood. i didn’t work that day ( thank goodness) i’ve heard she crossed the street diagonally and many cars swerved not to hit her. the poor food for less guy didn’t see her , because she wasn’t where any pedestrian should have been. i heard the driver was really crying. this poor man will have to live with this for the rest of his life. my sympathy goes to her family . Godspeed. Just to let everyone know the investigation turned out to be a suicide. The driver was not charged and will not be. This woman was running in front of other cars trying to get hit before she ran under the back wheels of the semi. The driver is taking this very hard and has been off from his job since this tragedy. One needs to consider how it will affect the other person they use to terminate their own life before their plan this action. I pray for this womans family as well as the driver of the semi! What was the womans’ name? yes, can someone from the Fire Dept or Police Dept please publish some information on this? strange that we can’t find any details on who she was or anything. Her name was Margaret Rosenberg. Today would have been her 75th birthday. She is a friend of mines Aunt. This is a terrible tragedy and I’m not sure where the “suicide” rumor came from but I don’t believe there is any truth to it. Very sad.